Luke and Obi-Wan set out on a mission to Alderaan to rescue Princess Leia. On the way they encounter new friends, old enemies and no small amount of danger! Complete mazes, codewords and puzzles in the uniquely illustrated, full colour activity book. 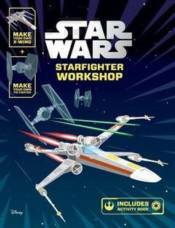 Then press out the pieces to create your very own X-Wing and TIE fighter models, perfect for recreating the famous Trench Run scene from Star Wars Episode IV: A New Hope.